Butte architect H. M. Patterson designed this brick home for attorney John Colter in the 1890s. Semicircular windows in the gables, stone lintels, a prominent portico supported by Tuscan columns, and an inviting front porch ornament the residence. Henry Muntzer, founder of the Butte Brewery, purchased the property in 1901 for his wife Mary and their eight children. Family members lived here into the 1940s, adding the east-side addition before 1916. Butte’s Soroptimist Club purchased the residence in 1947 for $5,500. The charitable women’s organization campaigned tirelessly for funds to transform the house into a temporary “receiving home for dependent, neglected, abused, or abandoned children.” With volunteer help from Butte union members, the Soroptimists added four new rooms to the rear of the building, repaired the porches, updated the wiring, installed fire escapes, added a third bathroom, carpeted the floors, and built a playground. In its first ten years of operation, the home cared for over 1,700 children. After the Soroptimists moved in 1970, the residence fell into disrepair. It was rescued by Steve and Janet Hadnagy, who spent years restoring it to a single-family home. Text from Historic Plaque by Montana Historical Society (Martha Kohl). 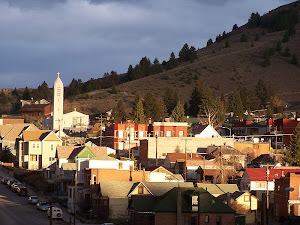 Photo by Richard I. Gibson (Anselmo mine in right background). For more information about the Soroptimist House, see Motherlode, by Janet L. Finn and Ellen Crain (2005).